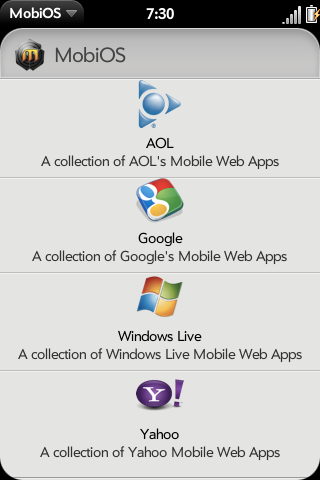 Ever have trouble keeping track of all of Google's, Yahoo's, AOL's & the Windows Live Mobile web apps? Now you can with one simple app!! Mostly a maintenance update. No major new features yet. Finally back with another update!!! Still need feedback on landscape functionality/errors. Donations: If you like the software that I'm developing, and find this app useful, please feel free to donate. Donations help support the further development of MobiOS & future apps for the Palm Pr?